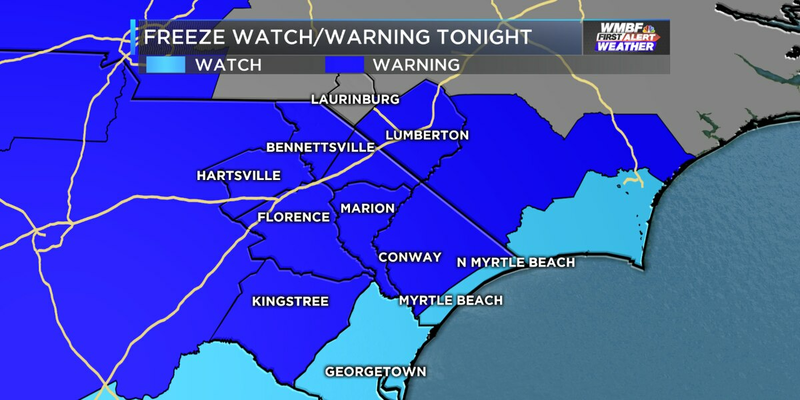 HORRY COUNTY, SC (WMBF) - The National Weather Service in Wilmington, N.C. has issued a freeze warning for the Grand Strand and the Pee Dee that goes into effect at 12 a.m. Saturday and runs until 9 a.m. The impacted counties are: Robeson, Marlboro, Darlington, Dillon, Florence, Marion, Williamsburg and inland Horry. dawn to shortly after sunrise.